The S7V8A switching step-up/step-down regulator efficiently produces an adjustable output between 2.5 to 8 V from input voltages between 2.7 and 11.8 V. Its ability to convert both higher and lower input voltages makes it useful for applications where the power supply voltage can vary greatly, as with batteries that start above but discharge below the regulated voltage. 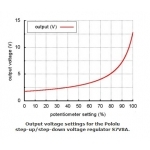 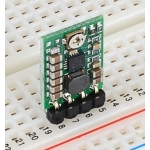 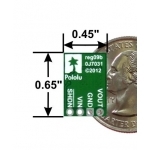 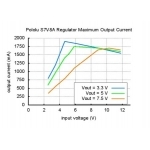 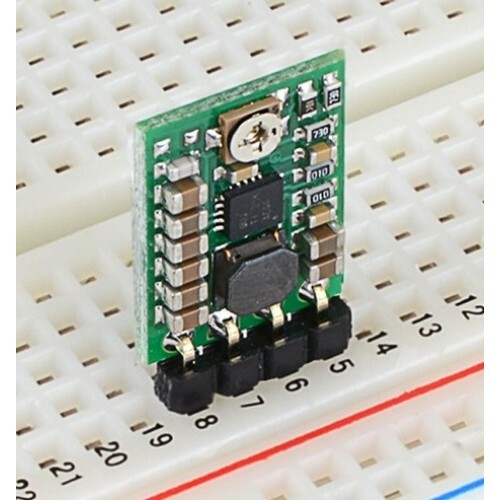 The compact (0.45″ × 0.65″) module has a typical efficiency of over 90% and can deliver 500 mA to 1 A across most combinations of input and output voltages. 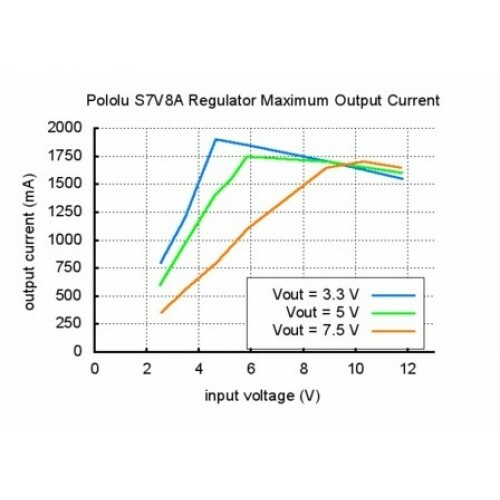 A single lithium-polymer cell can run a 3.3V device through its whole discharge cycle. The input voltage, VIN, should be between 2.7 and 11.8 V. Lower inputs can shut down the voltage regulator; higher inputs can destroy the regulator, so you should ensure that noise on your input is not excessive, and you should be wary of destructive LC spikes (see below for more information). 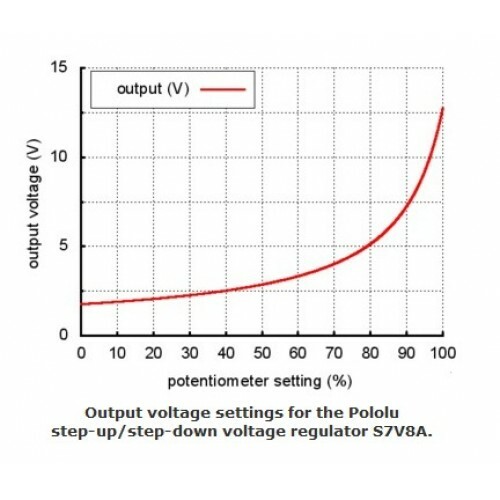 Please note that the output voltage can be set below 2.5 V at the low end of the potentiometer’s range and above 8 V at the high end. 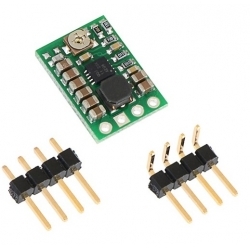 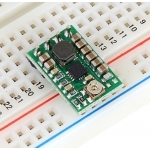 While this is not likely to damage the regulator, it might not work reliably or its output could become unstable when the output voltage is not within the recommended 2.5–8 V range. 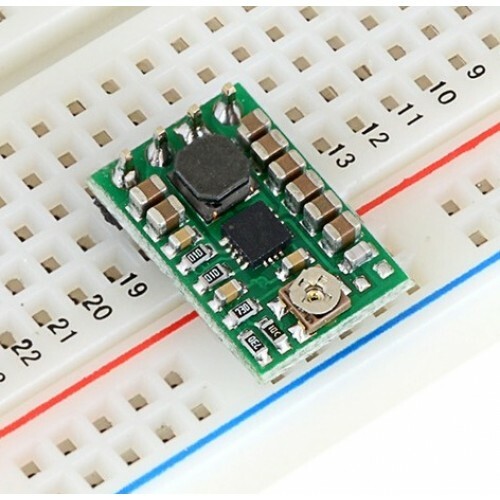 In addition, the potentiometer has no physical end stops, which means that the wiper can be turned 360 degrees and into an invalid region in which the output voltage is set to approximately 0.5 V.